This blanket scarf has been on my fall wishlist for nearly 2 years now. I finally caved and snagged one last week! I'm so glad I did; I think I've worn it almost every day since I got it. I found mine at Altar'd State for $30. I didn't think that was too bad for such a versatile scarf. I know there are cheaper versions of it out there (like here & here), but I know that Altar'd State's clothing is usually much nicer quality than the cheaper versions. With a piece that is going to be worn a lot this year and for years to come, I thought I'd splurge a little on a nicer piece. 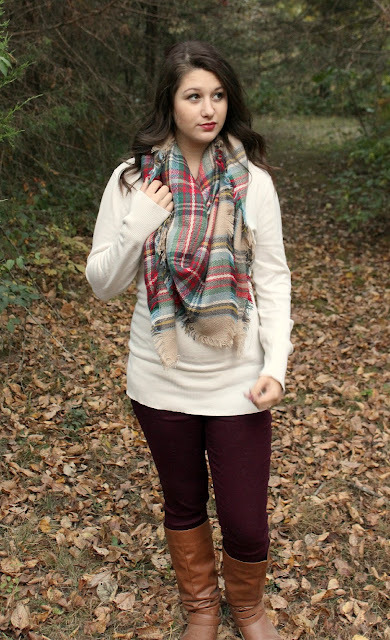 The burgundy jeans are another fall staple that I break out every year. They seriously go with everything! These are actually from Motherhood Maternity. I'm happy to say that at 3 months preggo I'm still rocking my regular jeans (buttoned and all! ), but I found these at a resale shop and couldn't say no to the opportunity to finally wear my burgundy jeans through my entire pregnancy! I missed them when I was pregnant with Lucy last year! I'd love to hear your favorite fall staples! Do you love the blanket scarf, too?